Yellow jackets receive their common name from their typical black and yellow color pattern. They are worldwide in distribution with about 16 species occurring in the United States. Yellow jackets are social insects and live in colonies. The adults are represented by workers which are sterile females, queens (fertile females), and males which come from unfertilized eggs and usually appear in late summer. 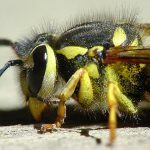 A Yellow jacket’s diet attract them to human habitation because the food we throw away is food to them. Yellow jackets will infest a residence with multiple colonies which can mean several nests on your property. Common nest spots include the base of trees, rotted logs, cracks or holes in the ground or pavement or under steps or porches. They can nest in dark, secluded areas in a house’s walls or foundation. Do you have a nest in your yard? Do you have them in your walls? Do you have a nest on your eaves or building exterior? Do you have a nest in a tree? Do you have a nest in the ground?